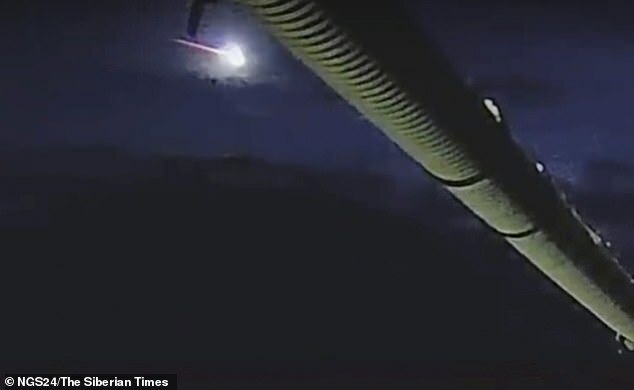 This is the moment a blazing meteorite shot across the night sky in Russia with reports saying it 'shook the ground' and 'warmed the air' before smashing through 3ft of solid ice. Spectacular new footage shows the 'small meteorite' flashing across the sky in Evenkia district of Krasnoyarsk region moments before impact last month. 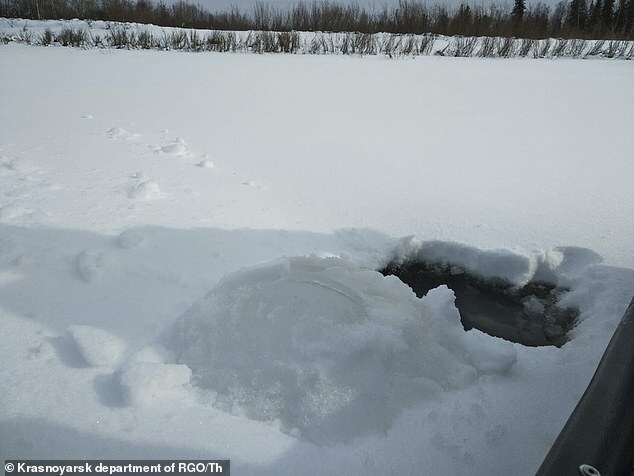 Russian scientists now claim to have located it and have sent leading experts from Moscow to examine the mysterious Siberian phenomenon at the crash site in the Podkamennaya Tunguska River. It was described as a 'glowing ball' that turned the evening 'bright and warm' close to the site of the world's largest 'meteor explosion' which had the force of 185 Hiroshima bombs. The meteorite split in two shortly before it hit the frozen river. Experts say one part of the cosmic rock smashed through more than 4ft of snow and 3ft of solid ice into the river. Scientists from Moscow's Vernadsky Institute say they have located the ice hole where the cosmic rock fell and an attempt will be made soon to retrieve the rock from the river bed. 'I was home when I heard loud thunder which sounded like an explosion. 'There was a huge glow, the floor trembled and dry branches fell off a birch tree in the yard,' said Natalia Moskvitina. 'I panicked and called my brother who lives some 300 metres away. 'The night got bright and warm, as if a giant light bulb was switched on in the sky', said witness Pyotr Bondarev from Tura village. Bondarev said: 'It was about 7.30 pm, it was dark. 'I was outside having a walk with my wife and children, when the sky flashed green and yellow. Locals claimed it was a 'second Tunguska'. More than 770 square miles of forest was wiped out after a fireball - believed to be some 330 ft wide - tore through the atmosphere and exploded, according to scientists.